It’s the iPhone !!! Yes, okay, you’ve heard of it. The iPhone has been around for a while so this ain’t exactly ground-breaking, but the handset is now officially available on Vodafone as well as three other networks in Britain – O2, Tescos and Orange. Yes, it is exactly the same phone so the only difference will be: price or I suppose network coverage, though unless you live somewhere quite remote standards tend to be reasonable all over. As we discussed before: Orange’s iPhone deal is practically identical to O2, and Tescos offered an eye-catching £20 a month deal but the savings on monthly payments were balanced out by a large down-payment required and of course reduced quantities of free calls and texts. 18 month contracts seem to be a minimum for the iPhone. And Vodafone? Well, it’s looking a lot like the O2 and Orange deals. 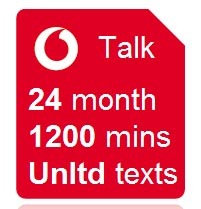 The general trend I can see is that Vodafone is offering more minutes and more texts, but is capping the 3G internet at 1Gigabyte of data flow a month. 1GB they say is enough to stream 16hrs of video or view 10,000 web pages. You also get free access to BT Openzone wifi up to 1G. Vodafone also offer you “free wifi at home” which is a bit ridiculous seeing as you’re paying for your home internet connection yourself. The 3G – available for £35 a month for *24 months. Includes and 1GB of mobile internet and webmail – note not unlimited like on O2. But significantly more minutes : 900 minutes and unlimited texts. The 3GS – available for £45 a month, once again, for 24 months: with a generous 1200 minutes and unlimited texts but the internet is capped at 1GB. Tescos seems too be the bast value.£20 a month for 12 months with £60 worth of call & txt & unlimited data. 32Gb iPhone 3GS is £407 & 16Gb is £320. Trade in value is around £200 with newer 4th gen iPhone likley to appear this Jun or July.